It’s not everyday that TWO exceptional Big Island oceanfront properties, sitting side-by-side, become available. Such is the case with this listing along the dramatic coastline in Kehena. Kehena (MLS# 258741) ocean view from lanai. The first property, (MLS# 258741) is a newly renovated 2 bed/1 bath home that is being sold furnished and is move-in ready. The 960-square-foot home sits on 0.2-acre with breathtaking ocean views in every direction. This time of year you can frequently see humpback whales, especially mothers and their calves, playing close to shore. 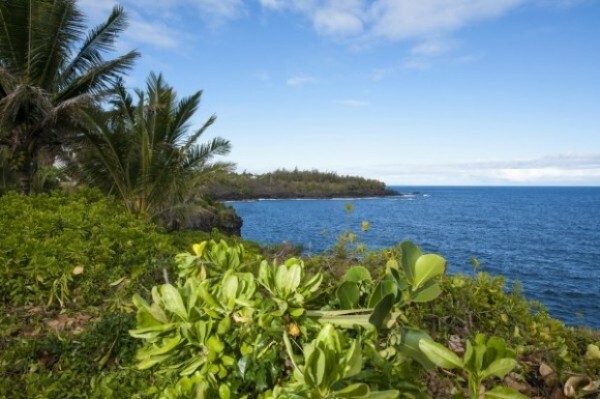 This oceanfront property in Kehena (MLS #258741) offers breathtaking views of the Pacific. 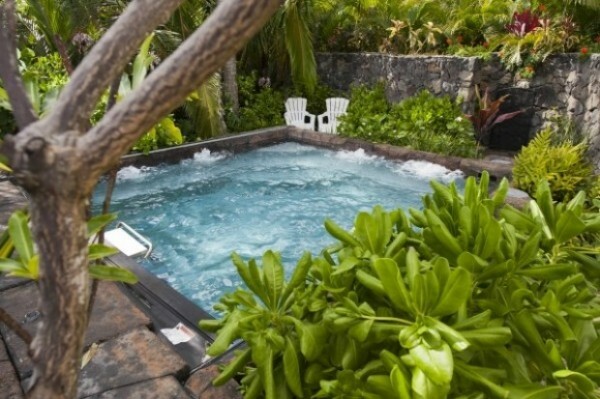 In addition, the black sand beach at Kehena is only a short walk away – or you can relax in your own swimming pool. Here in the quiet countryside you can stargaze from the comfort of the backyard hammock. 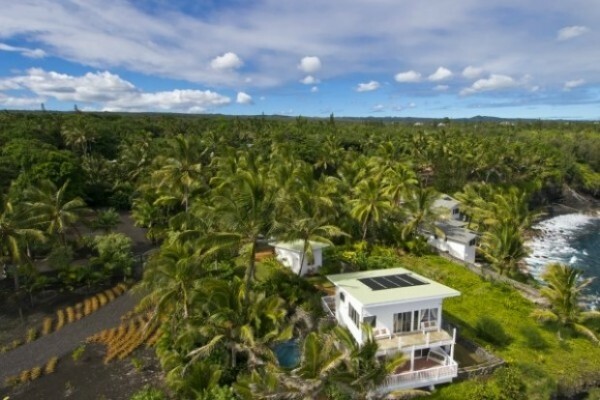 (MLS# 258741) comes complete with a swimming pool; the black sand Kehena Beach is also within walking distance. With a striking front gate created specifically for this property, beautiful rock walls, and professionally landscaped grounds that include palm trees and tropical fruits, the property feels like your own private Hawaiian vacation property. The second property (MLS #258747) is ready to build and already has beautiful rock walls, landscaped fruit trees, and this exquisite custom entrance gate. The second Kehena property (MLS# 258747) is a 0.5-acre site next door that is ready to build. It too features its own beautiful custom gate, lush landscaping with fruit trees and pineapples, as well as rock walls for privacy. This 0.5-acre of oceanfront land (MLS# 258747) is being sold with its neighbor (MLS# 258741); it’s rare to have two side-by-side oceanfront properties available. The lots, listed at $800,000 and $700,000 respectively, are being sold together. This situation is ideal for someone looking to retire to Hawaii, or for use as a vacation rental. You can live in the existing house while building an income property next door or build your dream house and rent out the existing home. Whether you are a retiree or an outdoor enthusiast, this part of East Hawaii offers a relaxed lifestyle with a multitude of activities. In a word, the Kehena coastline is stunning. You can take a leisurely drive or bike ride along the country roads and enjoy the lush and raw beauty of the shore. There are a variety of oceanfront parks nearby perfect for picnicking. In nearby Kalapana, you can participate in hiking tours to check out the ever-changing lava flow from Kilauea, just beyond the boundaries of Hawaii Volcanoes National Park. Nearby Isaac Hale Beach Park offers opportunities for surfing, camping, and boating, while the Kapoho tide pools are good for snorkeling. Multiple farmer’s markets are held weekly in the area so you can avail yourself to tasty locally-gown produce. The nearby town of Pahoa (a short 15 minute drive) offers a good mix of restaurants and entertainment, as well as shopping and spa services. 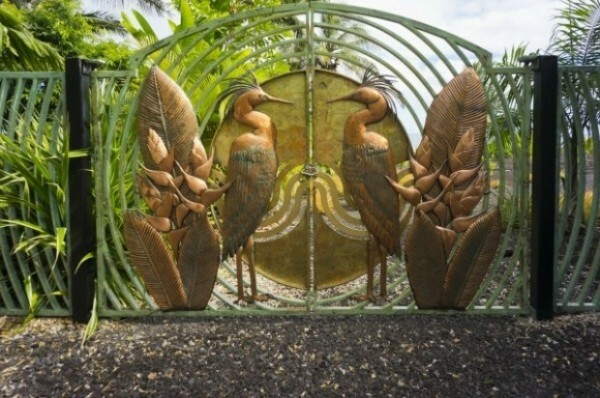 Hilo, the second largest city in the state of Hawaii, is only a 40-minute drive away. To learn more about this stunning secluded Kehena oceanfront property, call me at (808) 963-6880 or (808) 937-7246 or email me at Beverly@ElitePacific.com.